The second half of 1990 a sewing box called Rolyspace was introduced and in the 3 months time following its introduction, around 40,000 units were sold. Thereafter many leading sewing machine manufacturers succesfully took up this product in their range. 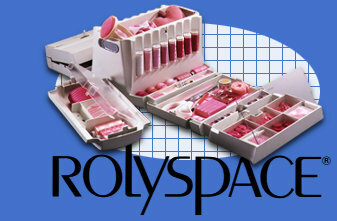 Rolyspace is the most ingenious sewing box in the world. It can be unrolled to both sides and keeps your small sewing accessories neatly in place. Awfully handy and a beautiful addition to your home. With special sections for 16 cotton reels and 16 bobbins, it has compartments for small accessories like buttons, pins and needles, but also for larger sewing accessories such as scissors, pin cushions and tracing wheels. Everything stays in its place and even in the cover there is a large compartment for storage. The Sew-to-Go. This product holds almost any choice of basics, is secure and durable and is easily carried, packed and stored.